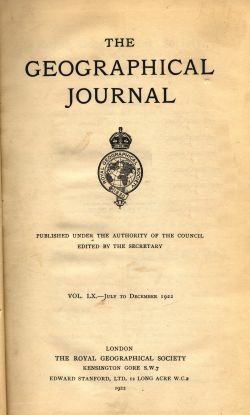 The Geographical Journal has been published since 1831, and is the Royal Geographical Society's journal of report. It has the highest circulation of any British academic journal in its field and publishes original research papers and review articles, which range across the entire subject of geography; they are restricted neither by area nor by topic. These academic articles are complemented by a large book reviews section and Society news, in particular its activities and meetings. Our collection is very nearly complete from Volume 59 (January 1922) to Volume 154 (December 1988), in sixty nine bound volumes; donations would be greatly appreciated.